We are now entering Closed Beta Testing for Exodus TCG Organized Play! A brand-new website dedicated solely to Organized Play has just been completed after being in development for over a year. We're inviting all retailers with a physical game store location to participate in the new program. A streamlined, easy-to-use system has been built to allow organizers to submit their tournament results quickly and efficiently. We know how valuable your time is when you're running a store, and that's why we've partnered with a brilliant programmer to code the new system who was also a game store owner himself. Submitting event results takes only a few minutes and gives your players credit toward their worldwide ranking, for both season and lifetime points! Why should you participate in yet another Organized Play program? What makes it different? 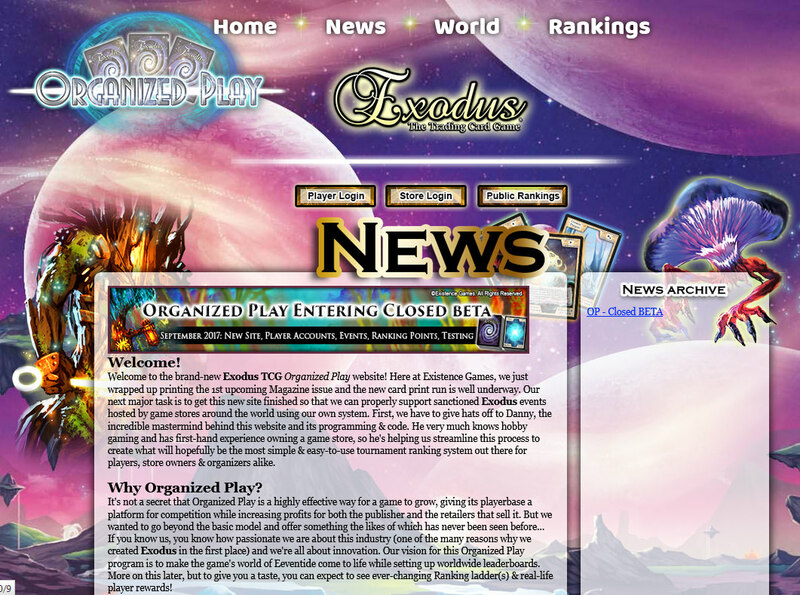 Exodus Organized Play is an interactive experience like none other, designed to bring more players in to your store and boost your sales of Exodus card products. Players can register an account for free on the new website and customize their profile by joining one of the game's 5 Guilds. They prove their allegiance to their chosen Guild by playing that type of deck at their local tournaments. When results are submitted, players will not only receive ranking points, but Guild points are tallied and affect the live 'Guild Wars' in real-time on the site. With new Promo cards released each month, whichever Guild is in the lead during any given month may result in the release of a Guild-specific Promo card as a result of players' deck choices! They may Guild-hop at any time throughout each tournament season. Additionally, players can literally affect the game's storyline according to tournament results and the top decks being played. We will keep a close eye on this aspect and ensure the direction of the storyline and new releases do not become limited or one-sided in the case of certain Guild popularity. We will make sure the game remains and continues to diversify in this aspect. New cards, mechanics, and themes will contain widespread balance so that the metagame never becomes stale. With these things in mind, we hope this program gives every store owner/organizer the tools and confidence they need to give their players the absolute best Organized Play experience while maximizing in-store profits. The game's lore and the world of Eeventide is coming to life, and we need your help to run tournaments and test the new system during the month of October 2017. We're looking for retailers to create a Store Account and provide us with feedback. Events will start at the local level with the opportunity for your regulars & top-performing players to earn invitations to larger events throughout the season! + More coming in the future like a card database! If you're not already, be sure to follow Exodus, The Trading Card Game on social media where we will post & advertise your upcoming in-store events: Facebook, Twitter, Youtube Channel.